Franschhoek’ s iconic Haute Cabriere Restaurant is well known for its unique location, set into the side of the Franschhoek Mountain and overlooking the valley below. Soaring arches and the view over the cathedral-like Pinot Noir Barrel Maturation Cellar below offer an experience which is not to be missed. On sunny days guests, at Haute Cabriere Restaurant, can enjoy the beautiful vistas over Franschhoek (the Gourmet Capital of South Africa) from the terrace, while on cool days a roaring fire creates a cosy atmosphere. Haute Cabriere’ s menu revolves around seasonal availability of produce, which is mostly sourced locally or even grown organically on the farm. A selection of full-and half portions, as well as a variety of smaller bites from the Haute Cabriere bistro menu encourage guests to relax and sample a variety of enticing pairings. 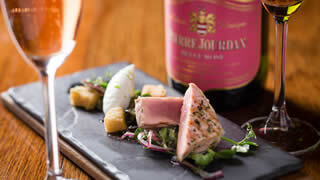 The flavours and textures on the plate are specifically designed to complement the range of Haute Cabriere wines and Pierre Jourdan Cap Classique’s – all of them served by the glass and by the bottle. Bringing all of these elements together, Haute Cabriere Restaurant offers the complete marriage of food and wine. Our restaurant offers breathtaking views of the Franschhoek Valley below.